Today was the worst day because it had been raining all morning and I was cranky because I wanted to go outside but I couldn’t. I was really tempted to wish for scalding weather if it gets rid of the rain. I was really cranky because it was my birthday. I got a present from my nana, SHE JUST GAVE ME $2. That made me even angrier. Suddenly my mom gave me a present and said this might cheer me up. She got me a picture of me outside when I was 2 and it was my first time playing football. After that, I got a present from my great-grandfather. It felt like another $2 so I threw it…Then I realised that it was a snow globe. Thank you for posting on the 100 Word Challenge. Wow! Your writing at the start had lots of emotion. I could really feel your anger. It was sad that you threw the snow globe at the end though. Well done for making the reader feel what your character felt. To make your writing even better next time, make sure that you think carefully about your ending. Your writing was so powerful at the beginning, it would be awesome to have it sustained until the end. Feel proud at what you have achieved. I look forward to reading more from you. 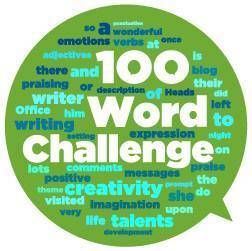 Thank you for taking part in the 100 word challenge.